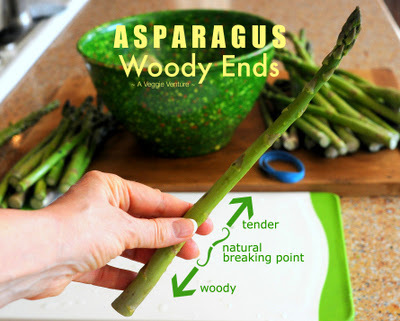 Asparagus & Woody Ends ♥ Bend, Bend, Snap! Bend, Bend, Snap! With step-by-step photos and A Veggie Venture's first video! How to "cut" asparagus to remove the woody ends, the woody stems. That's "cut" in quotes because the trick is to put the knife aside and instead, just snap the spears, one by one. Get into the rhythm. Bend, bend, snap! Bend, bend, snap! And as a special treat? A Veggie Venture's very first video! I'd love to know what you think! Who else has noticed that an asparagus spear may be as tender as can be at the tip but is as tough and woody as can be at the other end? That's why recipes here always-always suggest "snapping" off those woody ends before roasting, slow roasting, steaming, microwaving, whatever your favorite cooking method. But where does the edible, tender part of the asparagus spear begin and the woody part end? It depends, spear by spear but there's a natural breaking point. Here's how to find it. Just remember the rhythm! Bend, bend, snap! Bend, bend, snap! Wash the spears under running water, paying special attention to the tips where grit can easily collect. This is especially important with home-grown asparagus which haven't been specially processed for supermarket sales. The closer to the tip of the asparagus, the more tender the flesh. At the other end is the "woody" end. Some place in between is the "natural breaking point", the spot where the tender flesh magically separates from the woody end. So where is that natural breaking point? Well, that varies from spear to spear. But don't worry, it's easy to find, spear by spear. Here's how. Just gently bend the spear toward the end, if it doesn't break there with ease, move toward the tip a bit, bending and moving, bending and moving, until the spear breaks easily. After you do this a few times, you'll do it without even thinking. It's easy to remember. Bend, bend, snap! Bend, bend, snap! Oh! And don't miss the cook's treat! One end of that woody piece is usually a nice bite of fresh, raw vegetable while you're cooking dinner. Take a bite, it's great! Maybe the rhythm should be this? Now, for the first time ever on A Veggie Venture, a video! You've got it, right? So easy! ... quick, quick, they're all neat and tidy! Speaking of neat and tidy, have you noticed that gorgeous green bowl? It's my garbage bowl / compost bowl! It "lives" in one sink but I move it all around, depending on where I'm working, including the kitchen table or the back patio! Some times a recipe will suggest cutting off the tips – this is because the tips are the prettiest and most tender part of the asparagus. The recipe might not even have you cook the tips but instead use them for garnish. Or it might suggest cooking the tips, just for less time than the rest of the spear. If so, line up the spears by the tips, and slice them off. Some times recipes will call for peeling the asparagus. I rarely find this necessary. But it would be a good idea if the skins are fibrous and stringy, when they are, it's pretty obvious when you snap off the woody ends, a long string will tear off too. If so, sure, go ahead and use a vegetable peeler to peel the spear from the tip to the end. Some times I like to "stripe" the spears, this can eliminate stringiness without taking off all the skin. But it also opens the asparagus spears up to soak in flavors, like here in Roasted Asparagus with Balsamic Vinegar. Bend, bend, snap! Bend, bend snap! NEVER MISS A RECIPE! (OR A HANDY-DANDY HOW-TO LIKE THIS) For 'home delivery' of new recipes from A Veggie Venture, sign up here. Once you do, new recipes will be delivered, automatically, straight to your e-mail In Box. Being the frugal sort, I would love to hear recipes that would utilize the woody ends. I think I've read of a "cream of" soup that has you cook the ends until very soft and then pass them through a food mill to get the stringy bits out, leaving you with a puree. I'm not all that fond of cream soups, though- any other ideas out there? Thanks. Ditto re using the ends. I've invented something similar to Heather's suggestion but would love other palatable thoughts. You could use woody ends and other veggie discards for a stock. Heather ~ Hello fellow frugal person! Y’know, for the longest while I recommended making my (www.kitchenparade.com/2005/04/easy-to-elegant-asparagus-soup.php) with the ends (you can skip the small measure of yogurt or creme fraiche, I have and do. But then once I had a really stringy batch and haven’t gone back. But I’d start here, if you like soup overall. Sue ~ I guess we’re all wondering. It must be the big volume and the price of asparagus, these days? Williamsburg Beader ~ Love your stock idea, thanks for chiming in. Other Readers ~ Ideas? What do you do with the woody ends of asparagus? Is there something that can be done with the woody end besides throwing in the compost?